“I always wanted to eat earth. This project is the realisation of my desires.” Says Masha Ru, visual artist and researcher who has been investigating the phenomena called geophagy - eating of soil. When I first heard about her research it caught my attention and triggered certain sensations, the nature of which is not easy to put into words. There is something exciting about unconventional food habits. Questions about peoples motivation, experiences while eating unusual substances and impact on their bodies, occupied my thinking while working on my recipes. While creating unusual combinations, it is always an exciting moment how people will react to something they never tried before. But why limit ourselves to foods that are accepted for consumption in our culture? Why not to challenge our habits and perception and broaden the sensorial horizons. Exactly for that reason I invited Masha Ru so together we can create a gelato flavour with clay and start a dialogue about unconventional eating habits, its cultural, anthropological and political impact. Eating of soil and soil-like substances is an ancient spiritual and healing practice which is an integral part of culture in a number of countries in Africa, Asia and Latin America. For example, in Guatemala, Suriname, Indonesia, Ghana and Nigeria clay snacks and tablets are sold as edible products on the market. 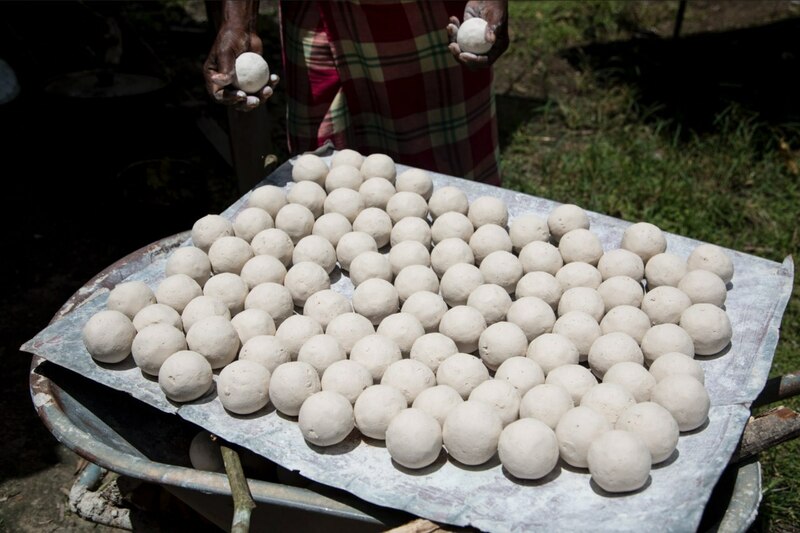 In particular, this tradition is present in Suriname. Apart from being an important part of Winti, pimba is an intrinsic component of the culture, as people often eat it as a snack. Especially, pimba is often consumed by (pregnant) women. There are a lot of controversies around this act and nevertheless it is still being practiced. In Europe and USA eating earth-based substances is officially regarded as a psychological disorder, known as pica - consumption non-nutritious items, including earth. Eating soil is discouraged, in particular in the Netherlands, as it can contain elements hazardous for health. However, some people in Amsterdam practice various types of earth eating. A number of popular brands available in health shops sell edible soil certified by the respective authorities. To discuss social, political, nutritional aspects of soil eating, we are hosting a special event on 19 May at 21 o'clock in our our shop on Van Hallstraat 222. Masha Ru will hold an artist talk followed by a discussion. At the event we will present the three flavours of clay ice cream developed in collaboration with the artist. Masha's ongoing project is made possible by The Netherlands Institute for Advanced Study (NIAS-KNAW), the Society of Arts-KNAW and Amsterdam Fund for the Arts (AFK). Spoonerist series is a platform to share Ludo & Hedo's experiments with multi-sensorial experiences and use gelato as a way to question conventions and explore the social and political dimension of food. During the events we will be sharing our findings and engage in an open conversation with anyone who is interested. The name of the series derives from “spoonerism”, an error in speech with an often humorous effect. In a similar vain, we aim to shake up the regular order of things and shift people’s perceptions. The events will be announced on our blog, Facebook and Instagram page and are free of charge.